Last year’s hurricane ultimately killed some 5,000 people, a new study claims. That’s more than perished in Katrina in New Orleans or the Sept. 11 attacks. The extraordinary number will buttress the federal overseer trying to curtail payments on the island’s $70 bln of debt. 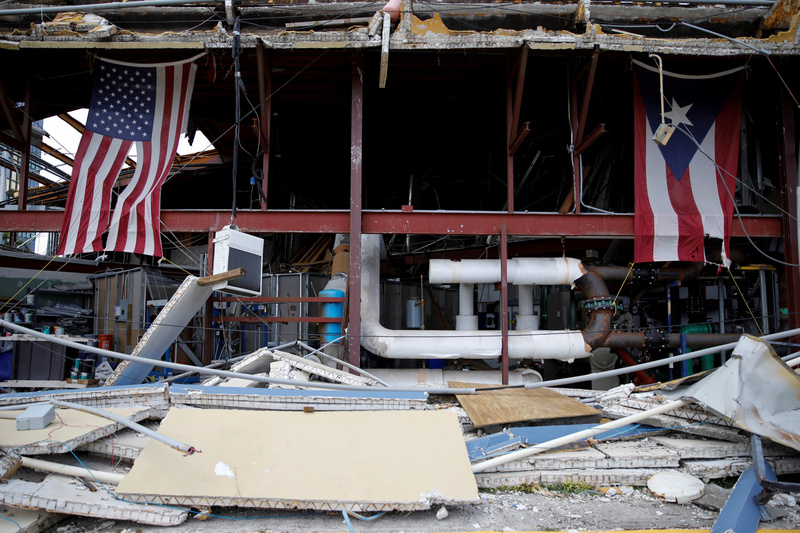 U.S. and Puerto Rico flags hang on a damaged church after the area was hit by Hurricane Maria in Carolina, Puerto Rico September 26, 2017. Puerto Rico suffered an estimated 4,645 excess deaths between Sept. 20, 2017, when Hurricane Maria made landfall on the island, and the end of last year, according to a study published on May 29 in the New England Journal of Medicine. The territory’s mortality rate increased by 62 percent in that span compared with the same period a year earlier, according to the study led by scientists from Harvard’s T.H. Chan School of Public Health. They based their findings on a survey of nearly 3,300 households. They said that the estimate was conservative, with statistical adjustments to account for survivor bias and household-size distributions raising the estimated toll to more than 5,000. On May 23, bond insurer Assured Guaranty and two of its subsidiaries filed a federal lawsuit against the Commonwealth of Puerto Rico and the Financial Oversight and Management Board of Puerto Rico claiming their revived fiscal plan was unlawful and unconstitutional. It said the commonwealth had ample funds available for both essential public services and debt repayment. The plan, adopted on April 19, calls for budget and structural reforms designed to improve the island’s fiscal position by some $12 billion by 2023 and restore economic growth.